Ford’s 1.0-liter EcoBoost three-cylinder engine has won its sixth straight “International Engine of the Year” award in the category of production vehicle engines with less than one liter of displacement. 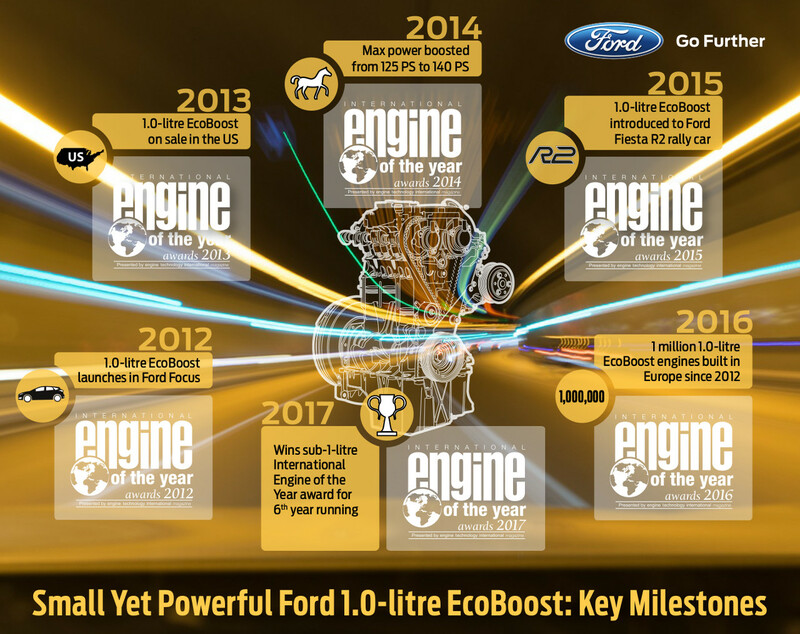 The 1.0L EcoBoost has been undefeated in its category since its introduction in 2012, and has actually picked up four additional “Engine of the Year” titles in that time: one for “Best Newcomer” after its introduction, and three naming it the best engine overall, regardless of size class. The panel of 58 automotive journalists from 31 countries who judge the awards praised Ford’s smallest-displacement EcoBoost engine for its mix of performance, fuel-efficiency, and technology. Three different power levels are available, the most capable of which produces 140 peak horsepower, and from early-2018, a new cylinder-deactivation system will be available, allowing one of the engine’s three cylinders to deactivate and reactivate automatically to save fuel. The process takes just 14 milliseconds. This year, the Ford 1.0L EcoBoost I3 had to beat out 34 other engines with less than a liter of displacement – nine more than when the motor was first introduced in 2012. Very interesting article but you called it a Motor when it won the Engine awards?